3 months after the first battle of the Civil War, Edgehill, a pamphlet describing the ghostly events that continued in the area after the battle was published. Titled “A Great Wonder in Heaven”, it reported the first encounter with a ghostly re-enactment of the battle by local shepherds. The priest at Kineton also described his brush with the ghosts when around the battlefield. King Charles dispatched a Royal Commission to investigate – they too described a ghostly battle scene, the details tallied with survivors actual accounts of the real battle. The villagers decided the only way to rid themselves of these phantoms was to bury all the battle-dead in Christian graves (the bodies still remained on the field through the winter). 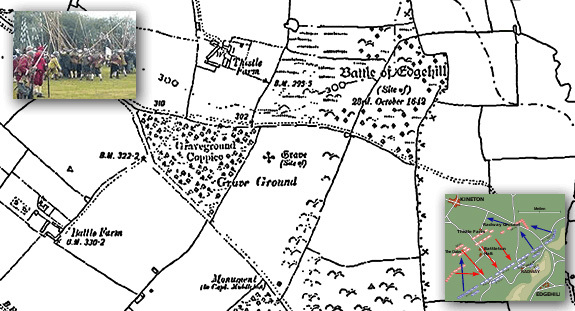 This map shows the battle area with Grave Ground and Graveground Coppice clearly marked. To this day, there are still reports of eerie sounds and phantom soldiers appearing at the scene on the anniversary of the battle. This entry was posted in Map of the week and tagged 1:2500 County Series, British Library, Downloadable maps, Heritage, history, Local History, Maps, Placenames, politics, UK by Cassini. Bookmark the permalink. All of the dead were reported by several contemporary accounts to have been buried the following day. As a result of the King’s Commission, the Edgehill phantoms, to this day, are the only apparitions to be officially recognised by the Public Record Office. I had a quick look at your website – very nice use of mapping.